"Quitting is not the same as failing." If anything, this one quote from Seth Godin was worth the little price of his little book, The Dip, A Little Book That Teaches You When to Quit (and When To Stick). If quitting is not failing, what is it then? Well, quitting a task, a job or a relationship is a "conscious decision you make based on the choices that are available to you." It is ok to say no, it is ok to choose to stop working towards something you started, it is ok to well, quit; but not without some focus and conscious consideration. Why is this important? You can't be the best in everything so identify the things you can excel at and quit the rest. "Quitting is not the same as failing." This perspective is important, and very timely, to me. I was on the verge of really wanting to quit my job and my profession, and really struggled because I felt like I would be failing if I did. Ultimately, I did not quit and instead committed to myself to making changes. Things simply can't stay as they are - for me or for the organization. So, what to do? I needed more information. Information sought and found it in this tiny little book. In 76 pages, Seth labels and defines exactly where I am right now - I am in a dip. Ok, just go with this one for a moment and ask, as I did, just what is a dip? Because I could not say it any better than Seth himself, here goes, "almost everything in life worth doing is controlled by the Dip . . .the Dip is the long slog between starting and mastery . . .the Dip is the long stretch between beginner's luck and real accomplishment." Well, check out the picture. This is the Dip. 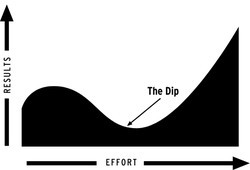 There are eight dip curves or "places where organizations and individuals are most likely to give up." Be prepared, you will face one or more in some venture, in some task or in some relationship at some point in your life. I am here and I want to be there. Where is here? I am in a very stable organization, supported by my staff, peers and leadership, I am making measurable (albeit seemingly slow) progress, I respect many of my top leaders, the values of the organization are not in conflict with my own and most of the time I really do enjoy what I do. I am in a 7-5, punch the clock, be at your desk to be contributing type of position, I am connected at the hip to almost every single action that occurs in my department, I am drained at the end of the day and more so, the work is no longer challenging to me. Where is there? I am out of the day to day details, I am able to consult, advise, share ideas, set direction, I am valued for what I do not where or for how many hours per day I do it. I am energized by the work. I am able to take my daughter to summer camps, during the day, and have energy to play when my work is done. I work with consummate professionals, many women and I create. So, what will it take for me to get out of the dip and move from here to there? Nothing less than 1) changing my assumptions about work and how it has to be done and 2) refining my skills. That is my goal and to stick with it, I will determine what it is I must quit in terms of tasks or relationships. On a final note, it is important to share Seth's point about quitting before you start or deciding in advance when to quit. 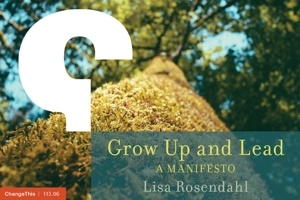 So at the risk of reproducing his entire book in this post (it was a short one!) here it goes, "if quitting is going to be a strategic decision that enables you to make smart choices in the marketplace, then you should outline your quitting strategy before the discomfort sets in." A BATNA (best alternative to negotiated agreement) came to mind for me as this is determined before you enter into a negotiation. Very similar. So, what about you? In what areas are you facing adversity or questioning your direction? Is this an area where you can be the best? Are you in a dip? More importantly, are you going to quit or are you going to stick?